Recently released State of Mobile Web Report by Opera confirms the fact that growth of Mobile Internet is continuing at a hectic pace. October 2010 saw a growth of 355.2 percent as compared to last year October. In October 2010, Opera Mini had over 76.3 million users, a 7.1% increase from September 2010 and more than 92% compared to October 2009. 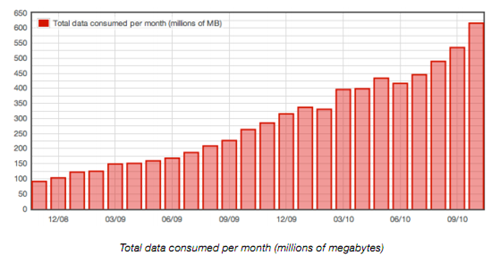 Opera Mini users viewed over 41.6 billion pages in October 2010. Since September, page views have gone up 12.6%. Since October 2009, page views have increased 142%. From October 2009 to October 2010, page views in the top 11 countries of the CIS increased by 128%, unique users increased by 44% and data transferred increased by 119%. Out of the 110 total handsets listed, 100 of them were Nokia, 5 of them were Sony Ericsson, 2 of them were Samsung, 2 of them were LG and 1 was Apple.